Taking your little ones on a farm holiday is a great way to teach them about the changing seasons, first-hand, to get a healthy dose of fresh air, and to get them so giddy with excitement about meeting and caring the animals that they won’t even realise they’re learning about where food comes from and how nature works. So dig out your wellies and waxed jacket and join the Joules set for delicious taste of the Great British countryside. 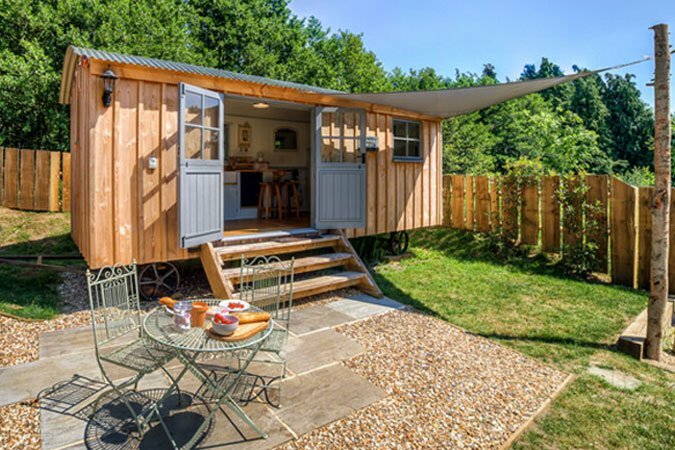 Where is it: Nestled on the edge of the National Forest in Leicestershire, The Dandelion Hideaway has six canvas cottages dotted around the 250-acre farm and its woodland, arable and grassland. What to do: Owners (and farmers) John and Sharon make friendly hosts and are keen to involve guests in farm life, from a guided walking tour of the farm with John to helping look after the hens and collecting the eggs, milking the goats and grooming the mini Shetland ponies. There’s also a farm shop and a brand new indoor children’s den play area. Budding Ray Mears-types might enjoy the new bushcraft skills courses, too. When it’s bedtime: This may be “glamping” but you get all the creature comforts you could hope for, including proper beds, en-suite bathrooms with roll-top baths, a living area with a sofa, and a farmhouse kitchen complete with a dining table and a wood-burning stove. If you want isolation then opt for Bluebells Nest, a treehouse which sits by the wood and is perfect for two plus a baby (for larger families the adjoining Bluebells tent sleeps five more), while all of the other cottages sleep six – which will suit families with a growing brood. Older children will love the ‘secret’ third bedroom, housed in a wooden cabin within the tent. Worth knowing: Pre-order one of Sharon’s farmhouse suppers that will be bubbling on the stove when you arrive, and the mini-tractors for toddlers are definitely worth pre-booking, too. Canvas cottages sleep up to six, from £700 a week, www.coolrentalguide.com. Where is it: It sounds incongruous, a luxurious hotel based on a working farm, but The Pig is all about its surroundings. Set on a 500-acre farm, this Georgian house in deepest, rural Somerset is still within easy reach of Bath – a ten-minute drive away. The food in the hotel comes from the vast kitchen garden and fruit orchards, or is foraged from the land, while every egg comes from the farms hens. What to do: You may be on a farm, but there’s no roughing it here. Take a much-deserved hour of me-time in the Potting Shed Spa, which uses fab organic Bamford products; feast on the incredible food in the greenhouse restaurant, where almost all of the menu has been grown or reared on the farm or within 25 miles of the hotel; or don a pair of wellies and get muddy on the land. You can visit the pet pigs (rather than the bacon pigs out on the farm) and the chickens and quails, wander round the plot, greenhouse, smokehouse and orchards that feed the hotel, walk the nature trail around the farm, or head into the 20 acres of woodland and deer park in search of spring bluebells or summer wildflowers. When it’s bedtime: There are 29 delightfully shabby-chic (but absolutely NOT chintzy) bedrooms, with railway sleeper floorboards, sumptuous four-poster beds painted in Farrow & Ball tones, woodland inspired fabrics and huge roll-top baths. Worth knowing: If you’re really adventurous, you can go out with the hotel’s forager in search of mushrooms, wild garlic and other hedgerow bounty that makes it onto the daily menu. Each room comes with a free Nespresso machine and fridge larder stocked with complimentary goodies (it’s also handy for stashing baby purees!). Double rooms from £139 a night, 0845 077 9494, www.thepighotel.com. Where is it: Relive your childhood holiday memories at Nettlecombe Farm on the Isle of Wight, where life feels reassuringly nostalgic. The 150-acre farm is just ten minutes from the beach at Ventnor and houses nine self-catering properties in cottages and converted milking parlours and stables. What to do: With donkeys, alpacas, goats, reindeer, Buff Orpington hens and a goose called Gordon and a peacock named Percy, Nettlecombe is not your average farm. Children are actively encouraged to meet and pet the animals and can even feed the lambs and piglets in spring. The idyllic setting, in rolling countryside, comes with three fishing lakes, a grassy play area with wooden play equipment including a tractor and Wendy house, as well as dedicated toddlers’ play area. The farm has also ensured that its facilities and accommodation are all accessible for disabled children so that everyone can enjoy the country life. When it’s bedtime: The simple, stylish accommodation ranges from the converted blacksmith’s forge that sleeps three to farmhouses sleeping four or five and cottages that sleep as many as ten. Worth knowing: You can arrange a supermarket delivery for when you arrive so that you needn’t spend your holiday schlepping round the shops, while the laundry room will be a godsend. There’s a library – but whether you’ll find time for reading is another matter! Various cottages that sleep from three (from £300 a week) up to ten (from £545 a week), 01983 730783, www.nettlecombefarm.co.uk. Where is it: From your posh tent, beside the River Wyre – take a dip in it if you fancy a paddle or swim – you’ll feel at one with the fantastic natural playground surrounding you. The dairy farm, which is home to these glam tents, sits on the edge of the forest of Bowland in Lancashire, and is just fifteen minutes from the coast, should you fancy a picnic on the beach. What to do: The farm is home to hens (and children are encouraged to collect the eggs from the coop each day), dogs, cats, ducks and rabbits, as well as goats – it is primarily a dairy farm. You can help to milk, feed and care for the animals, then head to the Farm Larder to pick up some bread and cheese made using the milk ready for a picnic lunch. The all-weather play barn has a sandpit, swing and giant slide, but if the weather’s on your side, then go and build a den in the farm’s woodland. When it’s bedtime: As a Feather Down Farm Days site, you are guaranteed a top-notch tent that’s fully equipped with real beds and a wood-burning stove, and a working, flushable loo – which you’ll be thankful of when your little one needs to go ”right now” at 5am! Tents sleep six and cost from £245 for a four-night stay (01420 80804, www.featherdown.co.uk). Our favourite city farms – and they’re all FREE! This small-but-perfectly-formed farm sits on just four acres and is home to sheep, pigs, goats, rabbits, chipmunks, snakes and tarantulas. There’s a playground and fab café too, with farm-grown veg on the menu. While Mudchute Farm is big – at 32 acres one of the largest in Europe – you won’t forget you’re in the capital thanks to the backdrop of Canary Wharf and the City. The River Café-trained chefs in the café are another reminder. Thankfully the horses, llamas, sheep, pigs, giant rabbits and hens will help you to forget all that for a while, at least. It’s said that babies love looking at owls because their faces look quite human. So it’s worth betting that your tots will probably enjoy this farm, which has an owl, small pets and farm animals, as well as a play area, café, gardens and farm shop. Hidden away behind the old Walker’s crisp factory, you’d be forgiven for not realising that this farm existed. But it’s well worth seeking out: there are all sorts of farm animals alongside rare Welsh sheep and pigs. In the heart of this Georgian city, you’ll find Aberdeen Angus cows, Tamworth pigs and Orpington chickens to name just a few. Several footpaths cross it and visitors are welcome to climb in over one of the many stiles or through a kissing gate rather than being directed through a single entrance. Urban, edgy Nottingham is the last place you’d expect to find a farm. This one may be small, but its got lambs and rabbits galore, as well as a café, shop, sensory garden and play area. With a pig called Flossie and a tortoise named Flash, this compact farm has a vast range of animals that you’ll get to meet, hold, groom and feed as you take an exciting guided tour around the farmyard. It’s ideal for little ones as it’s not too big and the animals are friendly, too (even our 11-month old enjoyed stroking the anmals). The indoor soft play area is worth the entrance fee alone – the whizzy slide with its ball pool-landing is not to be missed! Specialising in rare breed sheep, goats, cattle, pigs and horses (as well as some noisy ducks and geese), this traditional farm is neatly arranged for little legs and has some fun extras including mini tractors, a straw bale maze and a milking machine. There are daily animal feedings and children can help to groom the donkeys, too. The award-winning Pennywell Farm is not cheap but the entry includes half-hourly events and displays, a tractor and trailer ride, a train ride, and even a go-kart ride. The farms most famous residents are the micro pigs, which are just too cure for words, but you’ll find all the usual farm animals and smaller petting animals, too. This weekend we bought a tent! Yup, me, ex travel-editor of Glamour, miss luxe hotel, boutique boltholer and five-star spa-goer, I am going camping. Not even glamping, but real, genuine camping in my own tent, that I’ll have to pitch before I can sleep in it. So it’s not quite Bear Grills’ The Island, but it’s about as close to survival as my holidays have ever got – with added midges and mosquitoes thrown in. The original plan was a camper van stay on the Isle of Wight but we left it a bit late and by the time we factored in the cost of the van and the ferry it wasn’t going to be cheap or comfortable or reliable (I speak as a former VW owner!). So that’s how I found myself on the car park of Decathlon Surrey Quays at the weekend, weighing up the size and spec of varying shapes and size of tents. The only trouble is, now we’ve spent as much on sleeping bags, mattresses, foot pumps, mallets, night lights, torches and other camping paraphernalia and the weather forecast for the week is thunder and hale! Thank you GB. Make the most of spring’s arrival with a new season lodge, Shepherd’s hut or quirky cabin – it’s camping, but weather-proofed for fresh evenings. Sitting in 20,000 acres, Swinton Bivouac is a cluster of handcrafted, gingerbread house-cute log cabins hidden on the edge of the woods, with incredible views. Inside natural wooden floors, hand-made beds, antique rocking chairs and wood-burning stoves add to the up-cycled, eclectic vibe. As well as a small kitchenette, each shack comes with a flushing toilet and shower, and will sleep seven. There is a fab café, shop, and play area, and Bivouac guests can use the facilities at nearby Swinton Park – so you can combine a day walking in the dales with a massage in the spa or a posh meal. Down a quiet country lane, in the middle of an idyllic woodland meadow, it’s hard to believe that Ges, a lovingly-restored and converted 1970s horse truck, is not much more than an hour’s drive from central London. Inside there’s a king-size cabin bed, a sofa bed and a bright retro interior. And if you need the bathroom, the neighbouring pony trailer, Baby Ges, houses a hot shower and compost loo. A basket and blankets are provided so that you can pack a picnic and explore the bluebell woods. These rustic-chic wooden lodges, that sleep four, are hidden deep in Sherwood Forest but are contemporary and sleekly designed – from Mulberry and Designer’s Guild soft furnishings, to the state-of-the-art TV, iPod dock and wifi, to the fully-stocked kitchen, to the private hot tub. Yes, you get your own forest-view hot tub. David, the on-site concierge back at the reception lodge, can arrange bikes and advise on cycling and walking trails in the forest – which looks stunning at this time of year as the trees burst into life and bluebells abound. On the shores of the appropriately-named Loch Awe, the Ardanaiseig Hotel’s new Boat Shed combines contemporary architecture with splendid isolation – the glass-walled front looks on to the islands in the middle of Loch Awe and the snow-capped Ben Cruachan beyond. In spring the lake mist clears to offer truly spectacular views of the woods and mountains, reflected in the water. The one-bedroom bolthole, perched on the water’s edge is modern, romantic, and has all of the hotel’s five-star trappings on tap, too. Nestled on the edge of the National Forest in Leicestershire, The Dandelion Hideaway has six canvas cottages dotted around the 250-acre farm and its woodland, arable and grassland. This may be “glamping” but you get all the creature comforts you could hope for, including proper beds, en-suite bathrooms with roll-top baths, a living area with a sofa, and a farmhouse kitchen complete with a dining table and a wood-burning stove. If you want isolation then opt for Bluebells Nest, a treehouse that sits by the wood and is perfect for two. Pre-order one of Sharon’s farmhouse suppers that will be bubbling on the stove when you arrive. Circling a lake and nestled among trees turning golden brown, you’ll find four secluded, romantic shepherd’s huts, each with a private deck and fire pit. Inside, they’re surprisingly spacious, fitting in a double bed, fully-equipped kitchen and a bathroom – they even have electric heating and are insulated against spring nights. What could be more nostalgic than a stay in a traditional bow-top gypsy wagon? It even comes with its own kitchen and bathroom, housed in the next-door shepherd’s hut. What’s more, it sits on a 200-acre, organic farm in the Upper Wye Valley, surrounded by walking trails, cycle routes, the river Wye and Cambrian mountains, making it the ultimate, escape-it-all, back-to-nature break. Named after the Bronze-sage standing stones that top the hillside, Lord Stones is a gorgeous, glamorous campsite like no other. For starters, it sits in a stunning private country estate on the ruggedly-beautiful North York Moors. Then there’s the fact that there’s a fine-dining restaurant run by top chef Michael Chase, formerly of the Michelin-starred Star at Harome, which serves the estate’s own Belted Galloway beef on the menu, plus a lovely café and an artisan farm shop on site. There are five, new bespoke “glamping pods”, which are stylish timber cabins that sleep four and come fully equipped with a double bed and a sofa bed, a bathroom, kitchenette and a wood-burning stove. There’s even an outdoor deck with a BBQ, lanterns and seats so that you can enjoy the best of the camping experience with the comfort of a proper night’s sleep and running water. If you can’t afford the Orient Express, try out the next best thing – this antique London Brighton & South Coast Railway carriage gleams as if it has just rolled out of the station for the first time. Climb aboard, and into another era – the rich mahogany panelling takes you back in time to the glory days of rail travel. All the original fittings remain – authentic luggage racks, rounded windows, leather straps and brasswork – although the carriage has been converted to house a fully-equipped kitchen and bathroom, while the long bench seat in the main saloon transforms into a double bed and an antique French stove keeps it cosy on chilly nights. The accompanying “living van” houses two single beds (great for kids or extra guests). This newly-opened ash, chestnut, cotton and canvas yurt, sitting in a beautiful apple orchard, is furnished in rustic style – think soft sheepskins, a handmade double bed and wood-burner for warmth. The outside barbeque and fire pit make for a fabulous night under the stars – baked apples, anyone?